Red is a very emotional color. I say this in my own defense, since even the most ardent bird lovers are seldom moved to tears by woodpeckers. I can imagine the crustiest of field biologists blubbering like a baby at spotting an Ivorybill, and who wouldn’t feel at least a tingle when a Pileated swoops in to scatter lesser birds from a feeder? But woodpeckers of modest size, average shape, and non-endangered status don’t usually inspire spontaneous outpourings of emotion. Getting to Ecuador was a long, grueling process, so Pam, Tom, and I didn’t emerge from our cozy rooms at San Jorge Quito that first morning until it was well light. Mist shrouded the lush, green landscape as we ambled along the trails, stopping every few steps to give our lungs a chance to strain oxygen from the thin Andean air. Ahead an incandescent blur blazed across the trail. “RED!” was all I could manage as I fumbled for my binoculars. The blur stopped abruptly at the base of a small tree, bringing its true form into focus. From studying the field guide, I recognized it instantly. Early this week I returned from my first trip to Ecuador, a legendary destination for birders in general and hummingbirders in particular. The country’s bird diversity is hard to pin down, but based on The Birds of Ecuador field guide it’s nearly 1600 species, a staggering 132 of which are hummingbirds. 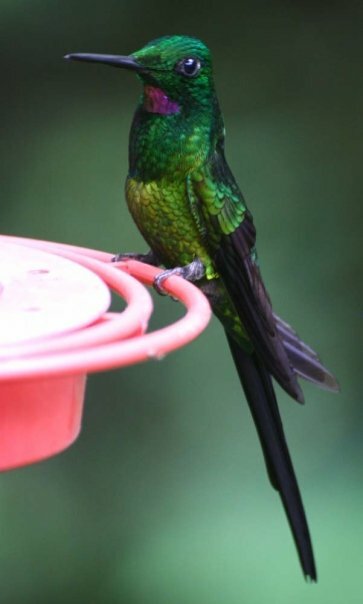 The Tandayapa Valley alone has recorded 41 hummingbird species. This was primarily a working trip, organized and financed by fellow members of the Southeastern Arizona Bird Observatory’s hummingbird banding team (mil gracias, Bill and Pam! ), so of course we spent most of our eight days in the country watching hummingbirds, but we got in some general birding, too. Between now and the New Year I’ll post on some of our adventures with photos of a few of the natural wonders we enjoyed. Here’s a male Empress Brilliant as a taste of visual treats to come.